As a CCPA economist, I sometimes feel like I’m constantly providing context to the big numbers governments throw out to impress or frighten us. Is $10 billion a big deficit? Well, if you’re an individual, yes, but if you’re a government with a $2 trillion economy (like Canada’s), then no. So what to make of the Conservative promise to create 1.3 million new jobs by 2020? First of all, no government gets to claim it “created” every single job that emerged in the economy over its mandate. The best it can do is suggest it “created” those jobs associated with its unique expenditures plus any multiplier effect, say for hiring people on an infrastructure construction site or in an EI office helping people who’ve lost their jobs. But the provinces spend as much as the federal government does in the economy (depending on how you count transfer payments), and households spend considerably more than both (going into considerable debt to do so). So who gets credit for new jobs? If anything, Conservative claims of having created 1.3 million jobs since coming to power, and promises to do the same again if re-elected, are mostly observations about what happened in the Canadian economy during this time. A second, more important thing to consider is that although 1.3 million jobs sounds like a lot, it’s much less impressive once you realize there will be between 1.8 and 2.6 million more Canadians aged 15 years and over potentially looking for work in 2020. Statscan numbers help us explain the problem (see Table 1). The employment rate is the proportion of Canadians aged 15 years or older that have a job. Canada’s employment rate was around 63% for much of the 2000s leading into the 2008-09 recession. It is currently at 61.3%, about the same as it was in 2009 at the worst of the recession. That drop implies the decline in the unemployment rate since the recession is not from people finding work, but in giving up their job searches or not looking in the first place. 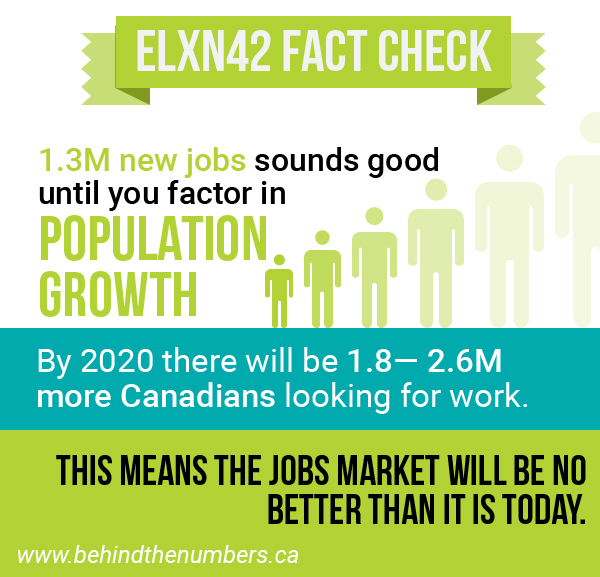 In the lowest population growth estimate from Statscan for 2020, those 1.3 million jobs only increase the employment rate to 62%. That’s better than it is today, but not by much. The middle population growth estimates (of which there are five: M1 through M5) produce an employment rate of 61.1%—worse than today and worse than what we saw from the 2008-09 recession. But if population growth is at the high end of the spectrum, based on Statscan estimates, producing only 1.3 million jobs by 2020 would result in an employment rate of only 60.4%, much worse than the 2008-09 recession. I doubt most Canadians would go for the slogan “Five more years of a weak jobs market!” Unfortunately, that’s all this promise would deliver. Note: I’m using July 1st as the start date of all this because the Statscan population estimates are for July 1, 2020, even though at the time of posting there were two more months of labour force survey data. Population estimates are admittedly a bit of a mugs game considering all that can change in five years, but then again so are specific jobs creation estimates five years from now. Perhaps I am mistake — and apologies if I am, but I feel this analysis neglects demographics. Canada population is not only growing, but it is also aging. Older age groups have lower employment rates. These differences are substantial among age groups over 55. If we hold fixed age-specific employment rates at 2014 levels, but allow population to grow within each age group (using the same data you reference in this piece), I find the 2020 aggregate employment rate would be 59.2%. So, the 60.4 and 61.1 rates you reference actually represent an increase relative to baseline. Employment rates can rise for all age groups (a strengthening labour market) even though the aggregate employment rate is falling. Hmm, I see what you’re saying, although if we age decompose the employment rates, set them to their rates in Aug 2015, but use the July 2020 populations. I calculate that you’d get an a weighted employment rate of 60% (in the middle pop scenario). In comparison to today’s weighted employment rate of 61.3% despite identical age disaggregated employment rates. Interestingly if you continue this line, I still think you’d need more than 1.3 million jobs If you want pre-recession employment rates. If you took age disaggregated employment rates in say February 2008 (peak pre-recession) + an increase in 55+ employment rates to say 38% (projecting out higher senior emp rates), you’d need 1.7 million jobs (in the middle pop growth scenario). Considering factors that change over time does seem to be a weakness. Another example is the recent claim that funding for Veterans Affairs has increased by 35% per Veteran under the Harper Government. I only had a cursory look ‘under the hood’ but this claim appears to be based on current dollars ignoring time value of money – in real dollars I would peg the increase at only about 17.5%. (FY 05/06 budget $2.85B for 220,660 clients, FY 14/15 budget $3.58B for 199,154 clients). Transfers to individuals, coincidentally, increased about 35% per veteran in real dollars (now at an average of roughly $13,250/client/year) but similar to the job creation claims highlighted in the article, I speculate the increase is driven more by the increased number and severity of injuries being compensated from the recent conflict in Afghanistan rather than by any actual increase on the part of the Government .